We’d love your help. Let us know what’s wrong with this preview of The Unreformed Mr Darcy by Lin Mei Wei. What if Elizabeth Bennet had accepted Mr Darcy's proposal in Kent? What if they married before he stopped being the proud, arrogant man she detested? What if, in order to avoid the ruin of her beloved sister, Elizabeth chose to swallow her pride and say yes to a pre-reform Darcy? Mr Bingley has left Netherfield, and in his stead a rich and unscrupulous man takes possession What if Elizabeth Bennet had accepted Mr Darcy's proposal in Kent? What if they married before he stopped being the proud, arrogant man she detested? What if, in order to avoid the ruin of her beloved sister, Elizabeth chose to swallow her pride and say yes to a pre-reform Darcy? To ask other readers questions about The Unreformed Mr Darcy, please sign up. This is a marvelous story. You may think you know where it's headed when Elizabeth decides to accept Darcy's proposal at Rosings even though she intensely dislikes him, but this slowly but surely steers that familiar-sounding variation in surprising directions. Jane has an unwelcome suitor: Mr. Caruthers. He is a leering lout, a wealthy tradesman who has taken over the Netherfield estate after the Bingleys vacated it. Naturally, Mama Bennet only cares about the "wealthy" part, pushing Jane to marry him, and Elizabeth worries that her sister will sacrifice herself for the sake of her family. 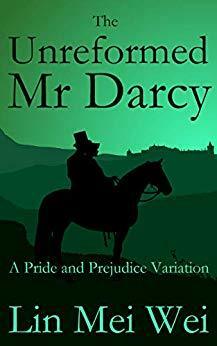 Elizabeth only thinks of Jane when she says yes to Darcy, knowing her mother will recognize the potential this marriage has to allow her eldest daughter catch an even better husband than merely a rich businessman. Ms. Wei does a wonderful job of showing Darcy both at his worst and at his best. In the early sections of the story, he actually believes Elizabeth shares his negative opinion of her family and will be as relieved as he to get away from them. When Darcy learns her true feelings about him (in the worst possible way), it's a complete shock. Elizabeth is stuck dealing with the cats of the ton, particularly the vicious Lady Howe (Darcy's cousin by marriage), without a visibly supportive husband beside her. She endures the London Season's social events, puts on a strong face for the servants and her family, and privately wallows in despair over her untenable situation. Colonel Fitzwilliam is his usual amiable self, but it's the colonel's brother, Viscount Howe, who really gets through to Darcy in one of my favorite scenes. Whenever a sticky situation comes up (and there are more than one), Darcy's heroism comes to the fore--always taking action, taking charge, providing solutions and reassurance. Elizabeth's gradual change in attitude toward him comes from her observations of his honorable behavior. Lydia plays a key role throughout the book as the catalyst for disaster. Mr. Wickham manipulates her shamelessly. Although she's still portrayed as a spoiled, spiteful character, I appreciated that, in the end, she's NOT evil or irredeemable; she's just an immature, naive child without the ability to foresee negative consequences of her actions. The writing flows well, and it's equally well edited. Point of view shifts smoothly from one character to another. While the introspection occasionally slows things down too much, especially in the first part of the book, it gradually turns into an action-packed adventure. It's way off-canon, expanding the plot and believably showing how events change these characters, including Mr. Bingley. I decided to take a break in my Bosch-a-thon to read some P&P and this was a genius choice.This is an absolutely delightful P&P what if that adds to canon but works brilliantly. We begin with Miss Elizabeth Bennet visiting her dear friend Mrs. Collins at Hunsford Parsonage. Here we have not Jane lamenting Mr. Bingley but instead Jane dodging and weaving to escape a loathsome Mr. Carruthers who has replaced Bingley at Netherfield but not in Jane's heart. Mr. Carruthers is still carrying th I decided to take a break in my Bosch-a-thon to read some P&P and this was a genius choice.This is an absolutely delightful P&P what if that adds to canon but works brilliantly. We begin with Miss Elizabeth Bennet visiting her dear friend Mrs. Collins at Hunsford Parsonage. Here we have not Jane lamenting Mr. Bingley but instead Jane dodging and weaving to escape a loathsome Mr. Carruthers who has replaced Bingley at Netherfield but not in Jane's heart. Mr. Carruthers is still carrying the stink of trade and is rude, crude, and socially unacceptable. Of course Mrs. Bennet doesn't see it this way at all; she instead sees £££; if only Lizzy could find a way to rescue her sister and reunite her with Mr. Bingley.... if only.... BAM Mr. Darcy Proposes and Lizzy says "Yes, oh yes"
And it is far from smooth sailing from here. I want to stress that this is NOT in anyway a forced marriage scenario - Lizzy goes in with her eyes opened and her heart hardened... while arrogant, selfish Darcy is besotted. We get a domineering, even if he is unaware, Darcy who plans their wedding and arranges everything except the wedding breakfast. Their marriage starts out wrong footed and simply gets worse and worse... until a dreadful occurrence forced them to work together and find their way. What I loved, the author didn't fill the story with useless words, discussions or scenes. She was brave enough to edit it like a book for grown ups who can get from A to C without B being spelled out. We get a lot of Darcy's perspective which spares us a lot of tropes. Lizzy is brave and resilient she rises at every attempt to intimidate her from the Ton. There is no epilogue the story ends. Period. This, for me, was a real page-turner. The story description gives us a clear picture of what to initially expect but things get very tense afterwards...quickly. Darcy is "unreformed" as no one he cares about has given him feedback at any time as to how his actions, even his looks, his mien can be interpreted by those who don't know him well. Then on top of that he has been pursued by women (and their mothers) for years so it is easy for us to understand how he thinks every woman out there would This, for me, was a real page-turner. The story description gives us a clear picture of what to initially expect but things get very tense afterwards...quickly. Darcy is "unreformed" as no one he cares about has given him feedback at any time as to how his actions, even his looks, his mien can be interpreted by those who don't know him well. Then on top of that he has been pursued by women (and their mothers) for years so it is easy for us to understand how he thinks every woman out there would be thrilled to marry him...and his money. And not having indulged in the act of flirting (ever) he believes that Elizabeth's retorts, her sarcasm, her laughing at him are all part of her regard for him. Thus we come to that proposal in Hunsford but here we have several differences from canon. Elizabeth is given overnight to ponder her answer to him. And that is heavily influenced by a letter from her mother which E. takes to mean that Jane has accepted (to save her family) the hand of an obnoxious man who has taken over Netherfield when Bingley moved out. Elizabeth sees two choices: save Jane or save herself. She puts Jane first. From here on out I am reading to learn when and how Darcy is going to find out that Elizabeth doesn't just not like him...she hates him. Marrying him is only just a little better than marrying Collins would have been. So this is not exactly a FMS; no one has been found in a compromising position, no one is "forced" to marry. But the results are the same; although Darcy has said he "admires and loves" her. Now (not to ruin the story with spoilers) the author has been very creative in how she brings about the "big reveal" and even in how she brings Lydia into a state of repentance. Drum roll: drama, angst, chases across the country side and even the sea! Begin this book early in the day or expect to stay up late if you are one who can't put exciting books down. Same old characters, yet different because are not static. Their experiences change them and make them ever so much better as the grow and change. And new character, evil, angelic, and everything in between to add new flavor to the P&P universe. Then there is Jane. She is the story’s Rock of Gibraltar 🇬🇮. You can try to fool her, you can beseech her, you can threaten her, you can kill her...but she will not do something she thinks is wrong. Bingley is wrong to call her an angel. She is not an otherworldly creature. She is a human, she is a Saint. A marriage of convenience trope. I thought the "convenience" part, very cleverly done. No compromise but neither was it mercenary reasons, at least not entirely. It was however, a bit dry in the beginning and it took me a while to get really invested in the book. I was honestly on the verge of quitting it when it finally grabbed my attention. It redeemed itself nicely though and turned rather angsty with a dark ambiance. Although the book did contain dramatc events, they were not the main contr A marriage of convenience trope. It redeemed itself nicely though and turned rather angsty with a dark ambiance. Although the book did contain dramatc events, they were not the main contributor to the angst. The angst came from a more personal and emotional level. Neither Elizabeth nor Darcy was particularly likeable in the beginning of the book but I enjoyed watching their characters develop. Entered at Hunsford, were the proposal went rather differently than in canon. Elizabeth took into account the benefits towards her sisters by accepting Darcy's proposal and found herself engaged to a man she despised. Darcy was oblivious to her dislike and did little to endear himself to Elizabeth. He was more concerned about the derision he would face from the ton and his family for his choice of wife. Their relationship deterred further by a scheming little sister and the marriage was ice-cold until a debacle with Wickham and Mr Caruthers ensued. Adversity can bring people together, although it might happen, painstakingly slow. I cannot but think that the author tried to increase my enjoyment by suspense and it worked to some degree. Would have appreciated a little less description of details in the surroundings though. In the end, I thought it well written, well researched and plausible. Would have preferred a bit more fluff at the end to reset my equilibrium though. I enjoyed this intriguing, delightful book. I was surprised at different moments which was fun. No spoilers given except to go read the book. In this Pride and Prejudice variation, Elizabeth accepts Darcy's proposal, but not for love - to save her sister. This is overall an interesting story with lots of action. However, it is definitely short on romance and the story lines in the book are unrealistic and somewhat contrived. The first problem is the wedding day & night of Elizabeth Bennet and Fitzwilliam Darcy. The societal norms of the day meant this couple couldn’t spend much time alone until they were married. It seems unlikely to me that a man of the time would agree to a large ball on his wedding night. He would want at least a week with his bride before such a an event. The party kept the new Mr and Mrs Darcy out most of the night. Unrealistic! Secondly the story is short on romance. The couple is affectionate leading up to the wedding, then there is very little romance until the very end of the story. This is not a positive in a story which is a regency romance. A young lady in the story is compromised and no one questions her about what happens. Yes, she does give an explanation to Elizabeth, but it was not detailed enough. I think the people of the time period would have asked more questions. I think a possible fiancé would have wanted more answers. I think this was an unrealistic outcome. I won’t give the plot away, but I can’t imagine why family and friends would not have asked more questions. The ending of the story seems very abrupt. It seems as if the author said, Oh I think I’ve written enough and just ended the story. The positives of the story include Mr Darcy and Mr Bingley’s characters. They are very honorable and heroic throughout the story. In addition the story was very fast paced. One exciting event quickly followed another. Every time I thought the story would drag on, something new occurred. The budding romance between Elizabeth and Darcy at the beginning of the story was very interesting. Unfortunately, it was very short lived. A rekindling of that romance would have helped this story. The story is interesting throughout the book. Despite this, the story overall seemed to be missing something. I think the story just isn’t deep enough. Now, this is a something I liked. I've seen lots of talk about what would have happened if Lizzie had accepted Darcy's first proposal because that was only halfway through the book. Darcy needed to be rejected to grow and Lizzie needed to be confronted with how she was wrong to grow, but in this book the two of them marry before this ever happens. Lizzie still finds Darcy insufferable and prideful, while Darcy remains thinking that putting a woman and her family down is the best way to propose t Now, this is a something I liked. I've seen lots of talk about what would have happened if Lizzie had accepted Darcy's first proposal because that was only halfway through the book. Darcy needed to be rejected to grow and Lizzie needed to be confronted with how she was wrong to grow, but in this book the two of them marry before this ever happens. Lizzie still finds Darcy insufferable and prideful, while Darcy remains thinking that putting a woman and her family down is the best way to propose to them. I really enjoyed this book. I like the marriage of convenience trope anyway and this one did it really nicely, giving Lizzie a good reason to accept Darcy even against her principles. I liked seeing how the two of them had to learn and grow in the marriage itself and how Lizzie had to put up with the ton and their opinions on her (very similar to Caroline Bingley), all the while not getting the support of her husband because she doesn't trust him with what she is feeling. Things took an unexpected turn near the end with the (view spoiler)[kidnapping of Jane (hide spoiler)] but I think this is one time where a strange twist is actually done well, in that it felt like Darcy, Lizzie and Bingley all reacted as they would of if it had actually happened. Plus Jane got a chance to shine and Lydia gets reformed in a way that takes into account that she is a young, naive girl who acts very irresponsibly at times. Having said that i gave it 4 stars because i do feel like there are elements in this books that are half done. Such as the Auggie, that bit was just thrown in there but left out to dry. The peak in that particular storyline was reached too soon and resolved too quickly. I would’ve like it to be drawn out longer and get the reader to be more curious & give the story a little more angst. I find it strange that such a huge thing was not discussed further in the book, especially during their journey or at least after the emergency was over. Elizabeth never got to meet Auggie or even received any news of her marriage. Secondly, i feel like the whole kidnapping debacle was over the top and unrealistic. After the long journey we took with Elizabeth and Darcy i feel that it ended too abruptly. I prefer their finally coming together to be more emotional, their interaction described in more detail. We got glimpses to Darcy’s struggle throughout first pasti the book but none in the latter parts. The plot is excellent and the story has its ups and downs. My major problem is the this Elizabeth does not have the character and resolve that I see often in other stories. She is dishonest with Darcy and herself and compromises her character. Her deceit is exposed early on after she married Darcy. She begins to feel the weight about half way, but does not address the issue until the next to the last chapter. The story has plenty of action but it also becomes tedious in the numerous separations that the action requires which keep the resolution of the relationship at bay. In addition, there are numerous lengthy flashbacks to fill in the gaps that are a bit overdone. When the action points occur, the story is very engaging. It is the downs between the action and interim that detracts. I read a review that said she couldn’t get past 25% of the book. And I have to agree. I almost put it down myself. If anything this book takes to long to get to the climax. I thought at first mr Darcy was the villain. She painted him so arrogantly ewww 😥. This book is a gem. It's so gratifying to read clever, funny, interesting and well written work, and this author has it all. The main characters are a little extreme: Elizabeth extremely set against Darcy; Darcy extremely snooty and blind to anyone's feeling but his own; Lydia extremely dense and spiteful. However these extremities are handled with humor and wit to make them easier to endure. There is plenty of angst, as when Elizabeth accepts Darcy, and when Jane is abducted. But there Fabulous! That said, I enjoyed the story. The final “adventure” was new and well thought-out. I question the speed of the characters’ mental recoveries, however. I would think something so traumatizing would have further reaching mental health issues. I don't know if it's the title or something, but I judged a book by its cover and therefore picked it up with some trepidation. Maybe it's because the whole "unreformed Darcy" trope cam be difficult to pull off without turning either of the main characters into a caricature. And at the beginning I did want to shake Elizabeth by the shoulders a bit. But very soon all that was left behind and both E and D emerged as flawed but human and quite three dimensional, even before undergoing th Delightful! Though the misunderstandings between Elizabeth and Darcy consume the first half of the story, the trials and tribulations of Jane and Bingley take center stage. Both Darcy and Bingley show their heroic characters, much to the chagrin of a new villain. Well done, Ms. Lin, as the attention paid to Jane and Bingley is a delicious and unexpected adventure. You always entertain us with your unlikely plots and superb character development of the other secondary characters. Not my favorite. Elizabeth seemed less... mature and strong in her character. I was distracted several times by things which seemed to be plot holes or inappropriate/unrealistic for the time period. If you aren't a stickler though, you may enjoy the very different plot from the original. If you're looking for a good Elizabeth accepts Darcy's first proposal variation, I recommend Unequal Affections by Lara Ormiston instead. I admit that my expectations are low when I try a new author of p&p variations as most of them aren't worth the time it takes to read them. This started off rather uneventfully and I almost put it down. I'm glad I didn't though, because it soon showed itself to be full of original twists, romance and adventure, escaping some of the usual tropes but holding with the original flavor of the story and characters. Good read. In Pride and Prejudice, Darcy proposed to Elizabeth in Kent. She responded by telling him of all of his faults which he set out to correct. In this story, following Darcy's Kent proposal, circumstances convince Elizabeth to accept his proposal. Thus they marry, each with their own faults and flaws. It makes for a very different story in a most wonderful way. I loved this novel! The author has a wonderful way with words, of bringing the reader into pages of the novel. I literally felt the pain of both Darcy and Elizabeth when he finally opened the letter with the “list.” And that continued on throughout the story, with a wonderful ending indeed! Thank you for sharing your talent! Interesting turn of events. Sorry Lydia's sorrow did not calm her for longer; that would have been plausible. And even the fantastic events were written plausibly. I believe the author when the neighborhood forgave the Bennetts. Interesting way to have Darcy learn of the impressions he leaves on others without him having to vow to change like Scrooge. Excellent fan fiction! The other story... if Elizabeth had said yes the first time. Loved it. Couldn't put it down. Moves quickly. Great thought of what might have happened if Elizabeth had said yes when Darcy asked her the first time. Different premise with enough canon to make a great read. First, thank you for proofreading your story! I was absorbed by the plot very quickly and although I am a "canonist," I appreciated the originality of your plot. Very well done. This refreshing book stepped away from the overused chapters of P&P to weave a new tale with our favorite couple. Full of unexpected twists and turns, and the occasional red herring, even Jane is affected. Do the good guys win? You must read it to find out. Enjoy. A nice change of pace, with a few different twists for our familiar characters. Some fan fiction can become terribly similar but this kept me engaged until the end. It was really good a little slow in some parts but overall I did enjoy this book. I recommend this book. Lin Mei Wei lives in England, in the Midlands (home of Shakespeare, pork pies, and Robin Hood) with her husband and her disreputable dog. Writing is about escapism for her. She writes when she's feeling anxious, stressed, overwhelmed or sad, so as to relax and to be happy. Jane Austen and Georgette Heyer are her biggest inspirations. She also loves cosy mysteries, historical novels and anything tha Lin Mei Wei lives in England, in the Midlands (home of Shakespeare, pork pies, and Robin Hood) with her husband and her disreputable dog. Jane Austen and Georgette Heyer are her biggest inspirations. She also loves cosy mysteries, historical novels and anything that features charming characters, witty dialogue, and a well-earned happy ending.